Help Emily restore her farm, or soon it will be a chemical waste site! Grow wheat, feed animals, and produce all kinds of goods. Fight Mr. Big and his lackeys. Thwart all efforts to ruin your farm. Get lots of awards for your victories. Special bonuses will aid you in your arduous task by helping you chase away evildoers, increase Emily's speed, and create various useful effects. A wonderful, prosperous farm will be yours if you succeed! 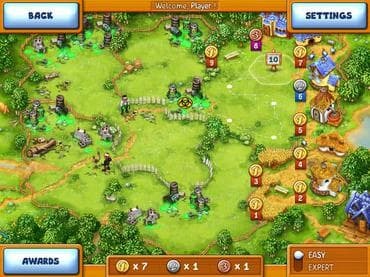 Free Game features: - 41 levels; - 12 unique buildings; - 14 goods for production; - 6 special bonuses; - Eco-friendly gameplay. If you have questions about Green Ranch game, please contact us using this form.